Fundamental Analysis: By reviewing macroeconomic factors, industry trends and company-specific issues, we assess each firm's forward-looking potential based on its strengths, opportunities, risks and weaknesses. We look for growth and sustainability in cash flows to support value. In essence, this is what every sell-side analyst does. It's what we do afterwards that ensures that our interests are aligned with yours. Independence Screen: Unfortunately, investment banking activity taints most of the research available from the sell-side. Our analysis shows that companies are 40% more likely to be rated as a Buy by brokers that are receiving fees from those same companies for underwriting services. ARC is free from any outside influence. As part of our value-added process we screen out the companies that we think receive more favourable recommendations due to investment banking activity. 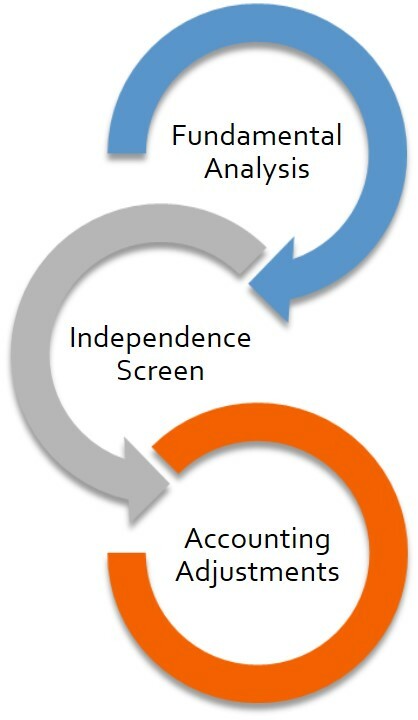 Forensic Accounting Analysis: We validate the integrity of the financial statements. If you can't trust the numbers behind your analysis, it doesn't matter what industry, sector or company you are analyzing. Confidence in the numbers behind your investments is paramount. We delve deep into the financial statements to not only flush out potential threats, but also to identify investment opportunities hidden by complex or inadequate financial reporting.